Panasonic ES-LF51-A Review: The Best Of The Arc 4 Line-up? The Panasonic ES-LF51-A is one of the newer Arc 4 models and in my opinion one of the most underrated as well. 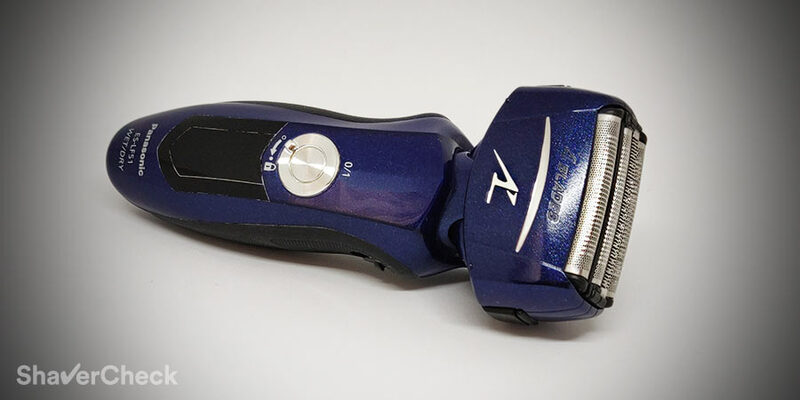 A shaver that has been flying under the radar ever since it was first introduced, the ES-LF51-A never managed to become as popular as other Arc 4 variations. And that’s a real shame since this particular model offers some really compelling reasons to buy it over other pricier shavers. Of course, no electric razor is perfect and the ES-LF51-A won’t be ideal in every single situation. 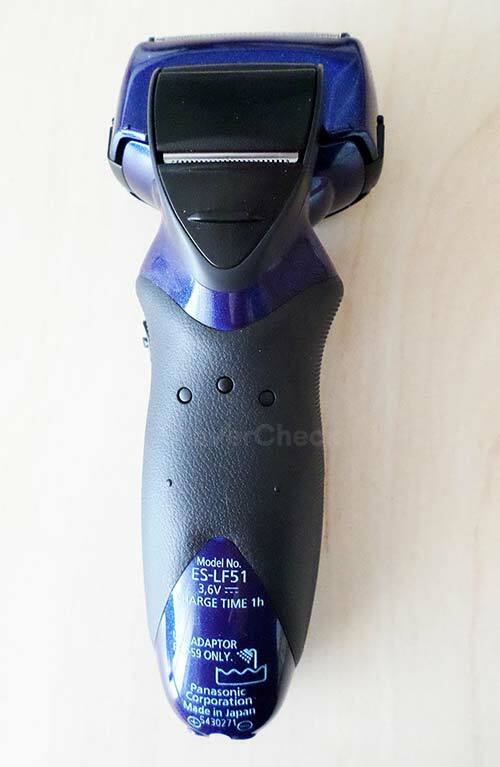 To help you decide if it would be a good choice for you, I’ve put the shaver through its paces for almost a month of use in various situations and have come up with an in-depth, real-world Panasonic ES-LF51-A review. Read along to see how it performed and if you should buy it. Wrapup — Who should buy the ES-LF51-A? The Panasonic ES-LF51-A Arc 4 is a foil electric razor that can be used both wet and dry. As the name Arc 4 suggests, it features a 4 blade shaving head (2 cutting foils, 1 slit foil, and 1 finishing foil) and it’s powered by a very fast and 14 000 CPM (cycles per minute) linear-drive motor. The blades are Panasonic’s now notorious nano-blades, made from high-quality hypoallergenic stainless-steel and sharpen at a very aggressive 30 degrees angle, ensuring clean and effective cutting. The head features a pivoting function, allowing it to move up and down and also to swivel from left to right. It can be locked in place when shaving delicate areas for more precision and control. The 4 cutting elements can also move independently. In typical Panasonic fashion, there are only 2 inner blades, while the other two are integrated into the foil assembly itself. Other features worth mentioning are the LED display, built-in pop-up trimmer, travel lock, 5 minute quick charge option and a sonic vibration cleaning mode. We’ll take a close look at each later on in the review. The Panasonic ES-LF51-A is surprisingly compact for a 4 blade razor. 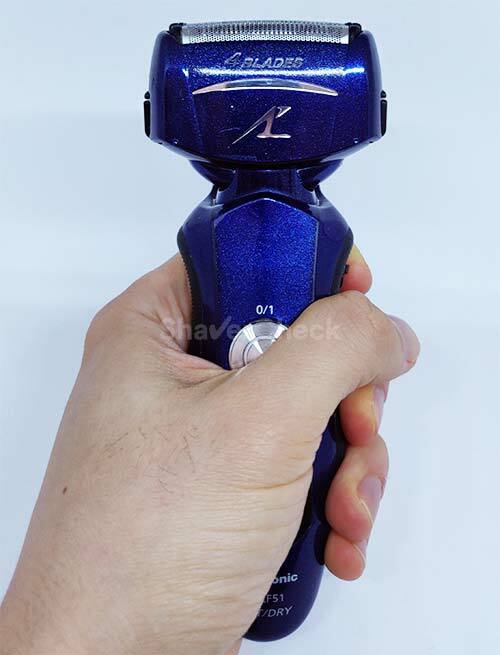 The shaving head is not as bulky as the pictures may suggest, while the shaver itself fits great in the hand and feels light and well balanced. Compared to ther Arc 4 variations, like the best-selling ES-LA63-S, the head is clearly more compact and while the difference doesn’t appear to be that significant in pictures, you will really appreciate it during use. The smaller head is in my opinion one of the selling points of the ES-LF51-A and also one of the main advantages over other Arc 4 models. 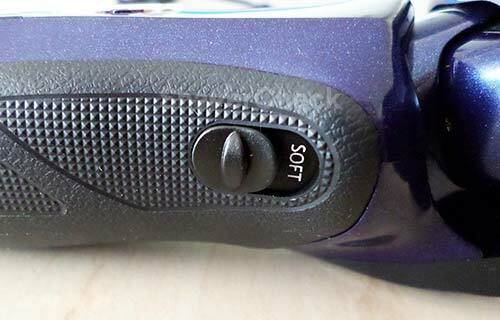 The build quality is usually very solid with Panasonic razors and this one is no exception. The plastic has a glossy finish with a nice pearly effect, while a textured rubber sleeve covers the back and the sides, ensuring a very secure grip. The 5 stage LED display is clear and useful, displaying the remaining battery charge in increments of 20%. Surrounding the power button you’ll find the circular travel lock switch, one of my favorite implementations of such a mechanism. On the ES-LF51-A it’s simple, useful and reliable. 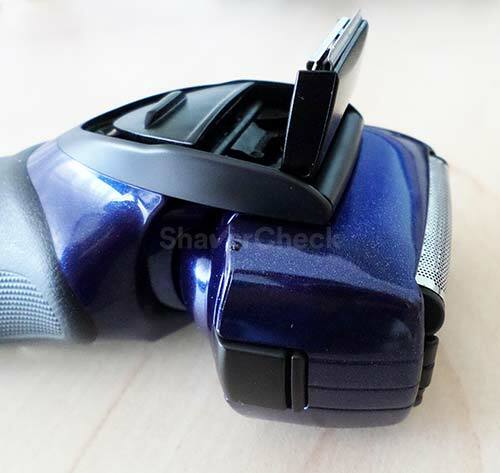 On the side of the shaver, toward the head, there is a switch for locking the pivoting head in place. On the back side there is a pop-up trimmer, typical for Panasonic shavers. As I’ve said in other reviews, I find Panasonic trimmers to be the best out of all the brands, even though the positioning isn’t always ideal. In this case, the shaving head gets in the way and you can’t really see what you’re doing. A quick and easy fix to this is to remove the foil and inner blades. Overall the build quality and ergonomics are very good and nothing really stands out in a negative way. Like all wet & dry shavers nowadays, the Panasonic ES-LF51-A can only be used cordless as a safety precaution. It comes with a Li-Ion battery that should be able to provide enough power for 45 minutes of use. And in real life use it matches the claimed numbers. Moreover, due to the fact that the motor maintains its peak power right until the end, it gives the impression of even longer battery life. Therefore, no pulling or tugging is experienced when the battery is running low as it’s the case with other electric shavers. Charging takes approximately one hour and is carried out via the included AC 100-240V adapter. When plugged in, the charge status icon will glow and the number of the battery capacity lamp will increase as the charging progresses. When completed, all the lights will turn off. Since it doesn’t come with a cleaning station, the ES-LF51-A must be cleaned manually after every use. And with the shaver being completely waterproof, this operation is very straightforward and easy. After completing the shave, just pour some liquid soap and water on the outer foil and activate the cleaning mode by pressing and holding the power button. After approximately 20 seconds it will automatically turn off. 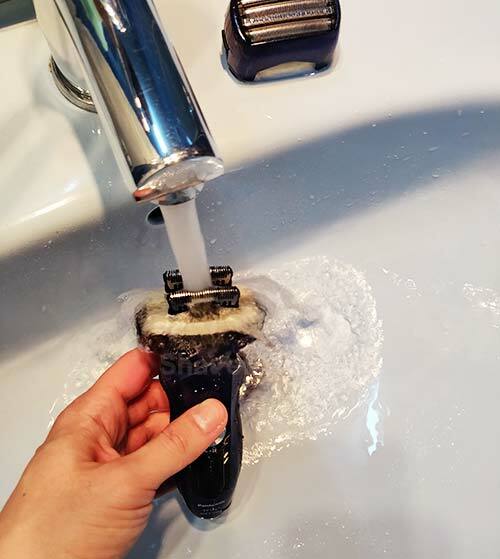 After that you just remove the outer foil, press and hold again the power button to activate the cleaning mode again and hold the shaver with the inner blades under running tap water. Give the outer foil a thorough and careful rinse too; pat the shaver and foil with a towel and let them dry completely before storing the shaver in a cabinet. Manually cleaning is a breeze with Panasonic shavers and the whole process takes under 1 minute. That’s not the case with the foil shavers from Braun for example or with a rotary shaver. As a result, there’s really no need for a cleaning station. You should however lubricate the shaver regularly, especially if you use liquid soap. Here‘s how and when to do it. I have been using the ES-LF51-A for almost a month by the time of writing this review. In order to get a more accurate and complete idea of its performance, the razor was used in various scenarios — one to three days of growth, both dry and wet shaving. The shaving performance was very solid, especially with regards to comfort. 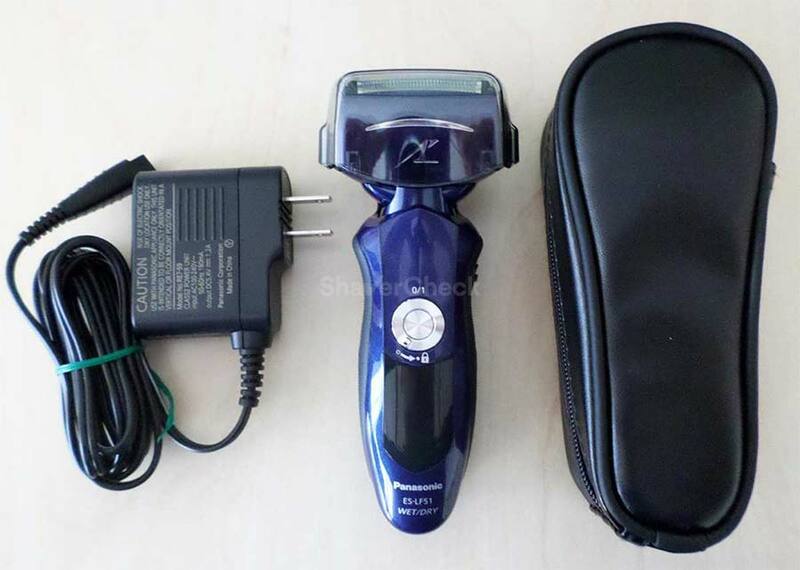 It was among the best electric shavers I’ve used in this regard and in my opinion the ES-LF51-A is arguably the closest shaving electric razor in this price range. It shaves effortlessly and with minimal discomfort — in the form of the foil getting warm after extended use — but not to the point where it would cause razor burn or irritation. I will however say that it is not as comfortable as a Braun Series 5 or 7 when used dry. I have very sensitive skin on the neck and it was sometimes a bit too aggressive, so keep that in mind as well. I also liked the fact that despite its 4 blades, the shaving head is compact and easy to maneuver and makes the whole experience very enjoyable. What really impresses is the fast 14000 CPM motor that really maintains its performance even when the battery is almost drained and manages to cut the hairs very close and with minimal effort. It does a great job at dry shaving, especially when used with a pre-shave lotion or powder. As expected, the razor also excels when used for wet shaving. The only time where I had to try harder in order to get a smooth shave was when I had to shave longer hairs on my neck that tend to lie flat and grow in different directions. Panasonic shavers are really not great with long facial hair — not even the very latest Arc 5 models. So I would stick to shaving daily or every other day in order to get the best results. All in all, a very solid performance, again, especially with regards to closeness. This is the part where I expected a bit more. Panasonic decided to only include a faux leather travel case and the AC adapter; not even a cleaning brush or a small bottle of oil for lubricating the foil and cutters. 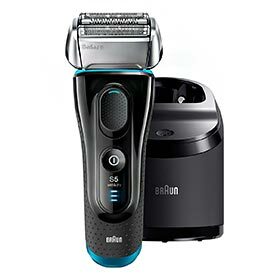 Other manufacturers — like Braun for example — include this type of accessories even for their lower priced shavers. Also, if you would like a cleaning and charging station you will have to look elsewhere as the ES-LF51-A doesn’t offer the option for one. Panasonic recommends replacing the outer foil every year and the two inner blades every two years. You can also buy them together as a set. While the blades are reasonably priced, the outer foil is a bit on the expensive side. Buying them together as a set could save you some money. 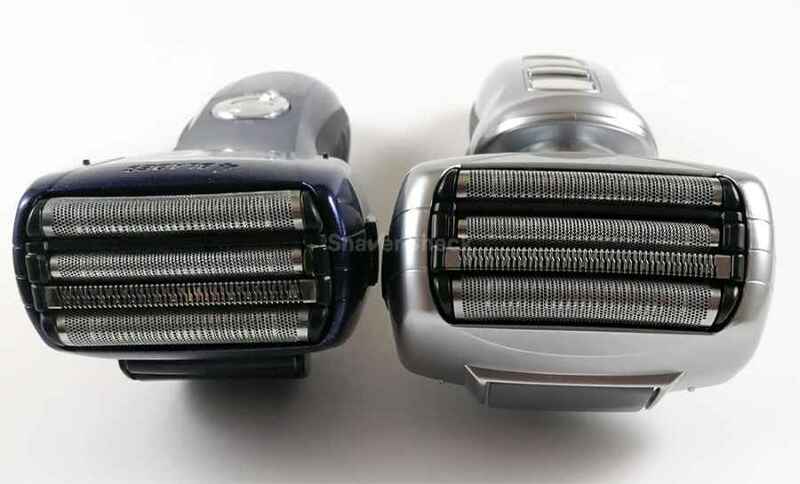 The blades and foil combo can cost almost half of the shaver’s price. As a comparison, a replacement cassette (foil and cutters) for Braun 7 Series 790CC usually costs quite a bit less than a Panasonic foil and blades combo. 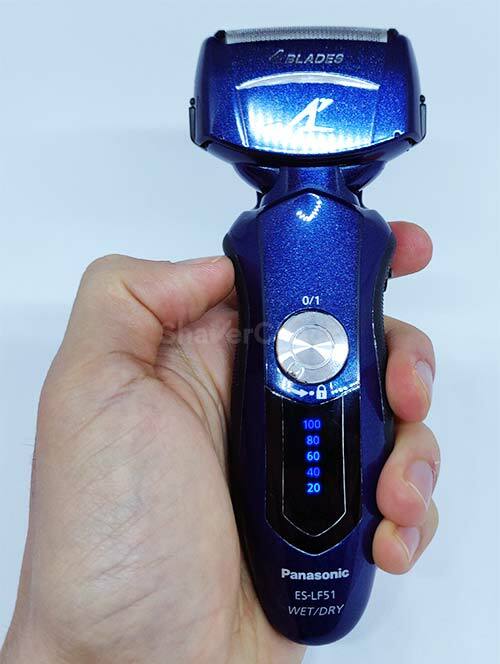 Panasonic ES-LF51-A is a very easy to use shaver that performs excellent, provides very close and generally comfortable shaves and has great battery life. It can be used for both wet and dry shaving and its compact size makes it suitable for traveling too. Anyone looking for a capable foil shaver should definitely consider it, especially men that want a really close shave. It can be suitable for sensitive skin, especially when used with shaving cream. It deals great with both coarse and fine hair, but again, it works best on shorter facial hair. It can also be successfully used for shaving the head. For starters, we have the excellent Panasonic ES-LA63-S from the same Arc 4 family, a very similar shaver in terms of specs and performance. 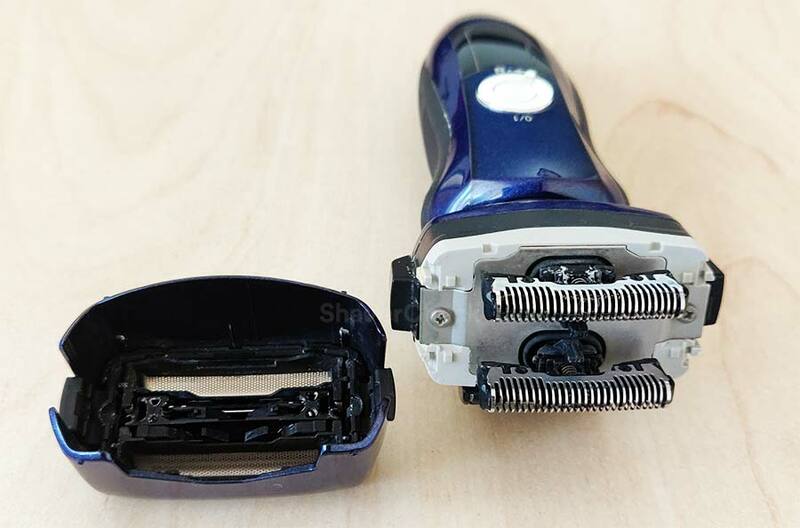 It has the same powerful 14 000 CPM motor, same inner blades, a more complex pivoting mechanism of the shaving head and can sometimes be bought for even less money than the ES-LF51-A in this review. 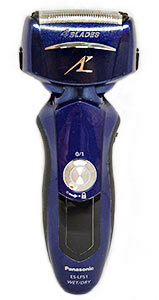 A unique feature of the ES-LA63-S is the addition of a second motor inside the shaving head that vibrates the foils to capture hairs more efficiently, similar to Braun’s pulsonic technology. However, I would still recommend the ES-LF51-A if you can get it for a similar price, the main reason being its compact shaving head. Also, the vibrating motor really doesn’t do much in terms of helping you get flat hairs more efficiently. If you have very sensitive skin, a Braun Series 5 is probably a better option for roughly the same price. The 5190cc/5090cc that we reviewed here would be the best pick as it also comes with an automatic cleaning station and is very gentle to the skin and forgiving. Unlike the Panasonic, the foils remain cool even after extended use. 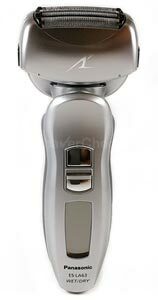 The replacement shaving heads are usually cheaper compared to the ones needed for the Arc 4 shavers from Panasonic. Also, the Series 5 works noticeably better if you shave less often, being able to capture and catch those stray hairs a lot more efficiently. And finally, the Panasonic ES8243A Arc 4 is a great choice if you have a limited budget. In terms of performance, the only difference compared to the ES-LF51-A is a slightly less powerful motor. However, 13 000 CPM it’s still easily enough and the performance drop will be insignificant. However, I would only recommend it over the ES-LF51-A if you can get it for significantly less money. Home » Reviews » Panasonic ES-LF51-A Review: The Best Of The Arc 4 Line-up? I have visited many websites recently for information about electric shavers, but now I don’t read anywhere else, as this is the best one! Thanks for compiling so much information around these devices and putting it out there. I have decided through your reviews that I would go for a ES-LF51, as currently it is priced about $78 (usd), vs $104 for the ES-LA63. (The cost includes shipping). 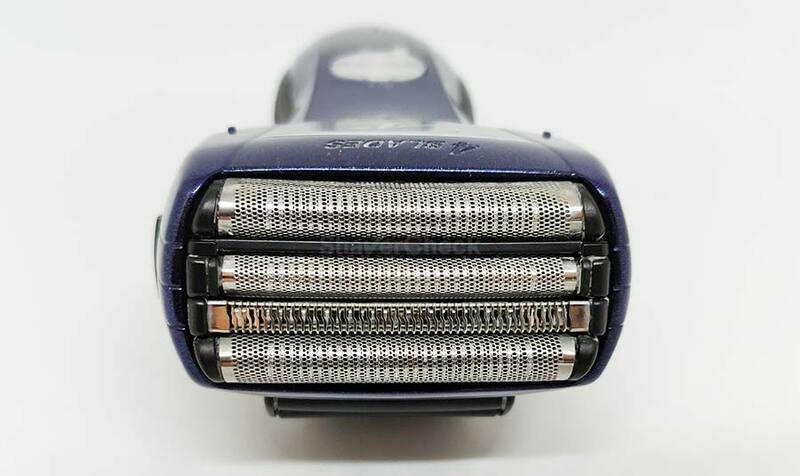 However what concerns me about this is that the shavers are becoming quite old by now, and especially the ES-LF51 is already less popular than the ES-LA63, so it seems likely that Panasonic may not be producing replacement blades for much longer. 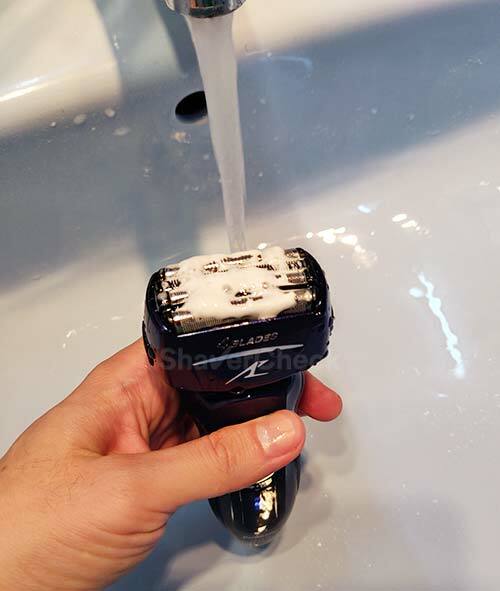 With your experience in using electric shavers, do you think that would be a concern, or a reason to buy a newer model, or even just the more popular ES-LA63? Currently Amazon only stocks 1 replacement blade for the ES-LF51, and it is more expensive than the ES-LA63 anyway. I wouldn’t worry too much about this. Yes, the Arc 4 line is getting a bit long in the tooth, but even if Panasonic decides to discontinue the series and release an updated one, I think you’ll still be able to find the parts. This is exactly what happened with the Arc 3 and the Arc 5 lines. And the Arc 4 shavers still seem to generate strong sales despite their age, especially with the current price drops. Also, the ES-LF51 is actually newer than the ES-LA63-S, so I would actually advise you to get it, especially if the price is (significantly) lower. No one can say with certainty what will happen, but again I don’t think you should let this keep you away from getting a certain shaver if you think it’ll be a good fit. For your peace of mind, after getting the shaver you could also buy a foil & blade set if you find one for a fair price. Just make sure to check various online sources, the prices seem to fluctuate a lot.